Where will Obama put the terrorists? On Thursday, President Obama directed the closing of the terrorist detention center in Guantanamo Bay, but not for a year. Politico's Josh Gerstein reports that Obama's order to close the terrorist prison sounds dramatic and unequivocal, but "experts predict that American policy towards detainees could remain for months or even years pretty close to what it was as President Bush left office." President Bush also wanted to close the terrorist detention facility. He directed Secretary of State Condoleezza Rice to try to repatriate detainees to their home countries, make sure they are held safely and treated humanely and that they are not allowed to perpetrate acts of terrorism. "The president has said he would like nothing better than at some point to shut down Guantanamo Bay, but there are a number of steps that need to be taken between here and that stated objective and they are tough issues," McCormack said. "There are people down at Guantanamo Bay who are very, very dangerous and you can't just let them walk free." What do you do with these terrorists? Do you imprison them here? Do you release them back into the battlefield? Since 2002, nearly 520 detainees have been released from detention facility. According to CNN, 61 of those former prisoners have or are suspected of rejoining the war Islamic extremists continue to wage against the U.S. One has even become the deputy leader of Al Qaeda’s Yemeni branch. Pennsylvania Democrat, John Murtha, told Fox News he'd be willing to house Guantanamo prisoners in his Congressional district. Most Americans don't want those terrorists in their neighborhood. Kansas Governor Kathleen Sebelius, a Democrat, and Senator Sam Brownback, a Republican, have publicly opposed the idea of bringing Gitmo inmates to Leavenworth, which is in close proximity to the surrounding community, including an airport, farms and hospitals. Brownback, terming such a transfer as "unwise and unsafe," has also introduced legislation calling for 90 days' notice prior to transferring enemy combatants to another possible site, in Charleston, S.C. The facility is within walking distance of the Port of Charleston and within two miles of civilian residences. Congressman Henry Brown, a Republican, has said moving Gitmo inmates there would be a "a high-risk move ... I am fearful for what they might bring with them, and I think it would put the local citizens at risk." But the local Republican Congressman, Representative Duncan D. Hunter, has mounted a fierce campaign against transferring detainees there. "The facilities, as they stand right now, are not designed to house large populations of inmates — they're not prisons," says Hunter's spokesman Joe Kasper. Pendleton has more than 2,600 buildings and structures, along with 7,300 housing units with 14,000 military family members. Hunter introduced legislation on Thursday to prohibit the transfer of Gitmo inmates to Pendleton or to the nearby Miramar Marine Corps Air Station. "Redirecting these detainees to Camp Pendleton would present a serious threat to surrounding military installations and resources, as well as the community's civilian population," Hunter wrote in a letter to Defense Secretary Robert Gates earlier this month. Home of the 3rd Marine Aircraft Wing, Miramar was included in the bill introduced by Congressman Hunter to prohibit transferring Guantánamo detainees to existing facilities or constructing new detention facilities in the same areas. This federal prison 90 is minutes outside Denver. 6. Metropolitan Correctional Center, New York City - located in lower Manhattan across the street from the federal courthouse, the high-rise Metropolitan Correctional Center primarily detains pretrial and holdover inmates. Are any of those facilities near your neighborhood? Obama's Press Secretary, Robert Gibbs, claims that closing the terrorist detention center somehow "made America safer." I don't see how. I agree with House Republican Leader John Boehner, as long as it is necessary to protect our national security interests, the terrorist detention facility at Guantanamo Bay should remain open. So the Bush administration got it right and the New York Times got it wrong all along. The New York Times reports a decision, made in December by the Foreign Intelligence Surveillance Court of Review, validates the power of the president and Congress to wiretap international phone calls and order, even when Americans’ private communications may be involved. In validating the government’s wide authority to collect foreign intelligence, it may offer legal credence to the Bush administration’s repeated assertions that the president has constitutional authority to act without specific court approval in ordering national security eavesdropping. Still, the new ruling is expected to have broad implications for federal wiretapping law, because it is the first time that any appeals court has ruled on the constitutional question of the president’s wiretapping power. You may recall that after it revealed the NSA's Terrorist Surveillance Program, the New York Times was accused of doing so in order to sell a book. Even the Washington Post took the Times to task for revealing the classified program. President-elect Obama, then a United States Senator, was highly critical of the presidential wiretapping power claimed by President Bush, and threatened to filibuster the revisions to the Foreign Intelligence Surveillance Act (FISA), which granted retroactive immunity to telecommunications companies participating in the NSA's terrorist surveillance program. Obama ultimately voted for the revisions, angering many of his left-wing liberal supporters. The warrantless Terrorist Surveillance Program is only one of the things Obama promised to have his Attorney General investigate. For his part, Attorney General-Designate Holder has already made his mind up, incorrectly, that President Bush was wrong to authorize the NSA's Terrorist Surveillance Program. "The agency officers will be well aware that bin Laden is a problem today because Mr. Panetta and Mr. Clinton and their colleagues chose to do nothing to protect America." Scheuer's remarks are sure to get under Clinton's skin. You might remember that Bill Clinton went nuts during his September 2006 encounter with Fox News anchor Chris Wallace. Clinton suffered his meltdown when Wallace asked him if he did enough to get Osama bin Laden because Clinton knows he did not do enough. "He clearly has nothing on his curriculum vitae that suggests he should be the candidate for this job," Scheuer said. "It's not apparent he has any talent that is pertinent to the job." Scheuer said Panetta's lack of experience could damage the agency and jeopardize national security. "What Mr. Panetta's appointment says is that there's no urgency in the mind of the Obama administration that they think they can send somebody over there who can learn on the job and that the enemy will wait to attack us," he said." Hillary's failure to give a straight response was the beginning of the end of her presidential campaign. MR. WILLIAMS: Are you for it or against it? SEN. OBAMA: I think that it is a -- the right idea. Obama couldn't be more wrong on this issue. The American people do not support giving driver's licenses to illegal immigrants. Even Democrats don't support the wrongheaded proposal that Obama calls "the right idea." The US Senate voted 69-28 to approve approved revisions to the Foreign Intelligence Surveillance Act (FISA) and grant retroactive immunity to telecommunications companies participating in the National Security Agency's (NSA) terrorist surveillance program. In his rush to the center and away from his extreme left wing positions, Obama "shifted" from his "unequivocal" opposition to retroactive immunity for telecommunications companies, and voted for the expansion of the government’s power to invoke emergency wiretaps. You may recall that after it revealed the NSA's Terrorist Surveillance Program, the New York Times was accused of doing so in order to sell a book. Even the Washington Post took the Times to task for revealing the classified program. It's way past time the Justice Department made some progress in tracking down the leaker. If we can spend who knows how much and more than two years to investigate who said what to whom to learn who revealed Plame worked for the CIA, we can damned well spend the necessary resources to determine who told the Times about the Terrorist Surveillance Program. I still don't find the Terrorist Surveillance Program very bothersome. We are at war, even though too many pretend we are not. I like the idea that someone is keeping an eye on suspected terrorist communications. A network of land-, air-, sea- and spaced-based sensors confirms that the U.S. military intercepted a non-functioning National Reconnaissance Office satellite which was in its final orbits before entering the earth's atmosphere, defense officials announced in a press release. Within hours of the reported success, China said it was on the alert for possible harmful fallout from the shootdown and urged Washington to promptly release data on the action. China is still smarting from all the international criticism about its secret and ill-advised attack on an aging weather satellite last year. The worrisome debris cloud created by the Chinese antisatellite missile test continues to threaten more than 800 operating satellites and will do so for up to 100 years. The Wall Street Journal contrasts the U.S. operation , calling it "A Shot in the Light:"
Contrast this operation with what happened a year ago January, when Beijing surprised the world by shooting down one of its weather satellites in a test of its antisatellite capabilities. Not only was the test unannounced, but it took China days to concede that it had happened. Because the satellite was destroyed at an altitude of approximately 850 kilometers, it left countless hazardous particles drifting in orbit that could harm future space flights. The Chinese and Russian complaints are tied to broader political gamesmanship over the "militarization of space" and efforts to get Washington to sign an international treaty restricting space defenses. China appears to have an antisatellite missile program of its own, while Moscow opposes U.S. efforts to place missile-defense sites in Eastern Europe. But the technology on display here is important in part because of Chinese and Russian actions. The U.S. has missile-defense systems in place in Japan, for example, to counter North Korea -- a dictatorship that wouldn't exist without Beijing's support. Russia and China are friendly with , which is rapidly developing long-range missile capabilities. If anything, the U.S. needs to spend more on such technology. Meanwhile, Washington has gone out of its way both to alert other countries of this operation and to avoid the kind of dangers posed by Beijing's last launch. The satellite will be hit at a low altitude to ensure that most of the debris re-enters either to burn up during descent or to land in the ocean. The Pentagon hosted a press conference last week to discuss the diplomatic and technological aspects of the operation. 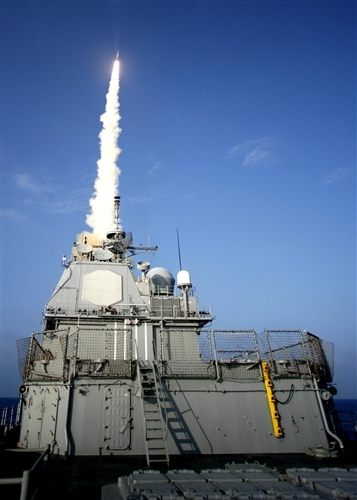 A military spokesman said this week that a press statement will be issued "within an hour" of the missile launch. This isn't the first time that the U.S. has destroyed a satellite. 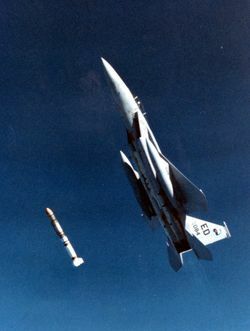 In 1985, a U.S. F-15 fighter jet fired a Vought ASM-135 ASAT missile which intercepted the Solwind P78-1, an aging gamma ray research satellite. According to CNN, the fact that we have had such a capability for over 20 years is evidence that the U.S. acted Wednesday strictly to guard against the prospect of a potential disaster. The Supreme Court has rejected the ACLU's challenge to the government's terrorist surveillance program. The ACLU won the first round, when U.S. District Judge Anna Diggs Taylor in Detroit, declared the terrorist surveillance program unconstitutional in one of the most blatantly political opinions I've ever read. The Sixth Circuit appeals court reversed the lower court and today rejected the ACLU's appeal. The case is titled "ACLU v. NSA." If only Nancy Pelosi were as supportive of our efforts in the war Islamic fundamentalists are waging against us. On Saturday I asked if New York Democratic Governor Eliot Spitzer could take the heat over his very unpopular plan to issue driver's licenses to illegal aliens. Today we learn the answer is no. Gov. Eliot Spitzer is abandoning his plan to issue driver’s licenses to illegal immigrants, saying that opposition is just too overwhelming to move forward with such a policy. Steven Greenberg, Siena New York Poll spokesman said, "voters think the Governor is wrong on the policy and on the rationale for the policy:"
"One year ago, Eliot Spitzer won 69 percent of the votes for Governor. In January, 75 percent of voters gave him a favorable rating. Only five months ago, 64 percent viewed him favorably and 55 percent gave him a positive job performance rating," Greenberg said. "All that’s changed in a New York minute." "Eliot Spitzer’s standing with voters has fallen faster and further than any politician in recent New York history," Greenberg said. "Everything may not have changed on day one but from the voters’ perspective, everything about Governor Spitzer changed in year one." The Governor’s fall is directly tied to his license proposal. Even Democrats can't understand why their party's national leaders embrace driver's licenses for illegal aliens, and see driving illegals as "de facto amnesty" and political poison.